Forums / 4. 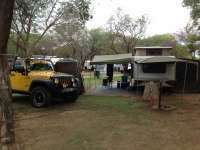 Resorts / Limpopo / Mapungubwe National Park - Mazhou Campsite - SanParks / How is Mapungubwe National Park ? How is Mapungubwe National Park ? Can anyone please shed some light on this park ? I am not able to access info about the park through the resort-listings. This would be one of my next "adventures" (if I and the van survive Namibia) since I like the bushveld and iassume that winter would be the best time to visit. Gerd have you looked Sanparks forum you may find some reasonable info on the park there. Thanks, I was on the Sanpark website but could not see any pics of the park or the sites. Not sure if they have any photos of the campsite. Here are a few that I took of our site. All the sites look out into the bush and form a circle around the ablutions in the middle. Daai foto nr 3 wys hoe lekker dit is om te kamp!!!!! Sal n plan moet maak en kyk of nog n plekkie oop sal wees in Julie/Augustus. Dit lyk heerlik, wil ook nog gaan kyk hoe lyk dit nou daar. Ek was in 1979/80 in beheer van Natuurbewaring daar toe dit nog die weermagreservaat "Vhembi" was, waar die ministers en generaals in die wintermaande kom jag het. Ek was 1 van die klein groepie staandemag lede en dan was daar die komandolede wat hul 3 maande kampe daar gedoen het. I was there with the commandos - but during the period 1975 1980. It was my best nature experience yet while being on patrol for days and sleeping under the stars. If I remember correctly, the base was called GREIFSWALD (before my days) and was also used for the rehabilitation of drug addicted soldiers. These might bring back some memories of the units that did srvice there. There are still other signs of where the camps were. The camps were at the confluance of the Limpopo and Shashe rivers. You are correct, remember the pool on top of the overhanging rock? It was built or made in the solid rock, by the druggies who were kept there. The one area down at the river was called "Poachers Corner", that was where the generals and ministers camp was set up when they visited every winter for their hunting trips. I took the commando guys out on game drives with my Landrover over weekends. It was my duties every morning at 6 to take the guards to the main gate, which was a few kms. from the main base, past the Mapungupwe koppie. then I drove down to the river to inspect the fence, where elephants broke through during the night, so the guys can fix it to keep the "Foot and Mouth" cattle out from Zimbabwe side. I enjoyed my time there! Was wondering if there will be any comments on the insignia of the Rhodesian Light Infantry (second photo) on South African soil. Who knows anything about their presence at Mapungubwe? The first photo is of the insignia of "4 Parachute Battalion". We were at Mapungubwe for 8 nights in April, it was awesome. Very different from most parks, but it is an absolute must. The camp sites, scullery and ablutions were spotless. The camp was full every day, but everything is very neat. Your braai and boma were cleaned on a daily basis as well. The staff was very helpful and friendly, we had a great time. Beware of the monkeys and baboons, they are very destructive. They know how to open ammo boxes, zips of your tent including your fridge. Keep everything under lock and key, use cable ties for the zips, they take anything and everything from a cup to a plastic bucket. One of neighbour's cell phones were taken whilst they were sitting around chatting. It was actually very funny, because they even steal your food out of your plate when you're not looking. But I suppose we are invading their space. We will definitely go back. One more thing, all supplies and fuel must be purchased before you hit the park, there are no shops nearby. Alldays is the closest, about 70km from the park. We have just returned from a trip to Mapungubwe - but not with the caravan ( Thank G-d). The campsite ( Mazhou ) is very small but clean, and beautiful...but the gravel road to access the site has been destroyed by the floods a few years back, and a bridge is washed away...leaving only a very bare 4X4 track that we struggled with even in our 2X4 Ford Ranger. If you're looking for a place to literally get away from it all - then this is the one!! Thanks for the update Bev. One of our favourite parks. Using the campsite as destination which part of the Den Staat road is very bad. The road from the main camp or the shorter section from Pontdrift? Sien Hendrik M het 'n vraag gevra oor die Rhodesian Light Infantry wapen in die Park. Hendrik -- daardie wapen op die tweede foto is die wapen van die Rand Light Infantry wat daar Grensdiens gedoen het in die 70 en 80'er jare. Die Eenheid het die samesmelting van 94 oorleef en is tans nog 'n aktiewe Deeltydse Mag Eenheid van die Infanterie Formasie van die SA Leer. Wow. I didn't realise that this is where Greefswald was! We're planning to go to Mapungubwe this winter once the Surfer has had some gravel road upgrades. Any advice or comments will be most welcome, like which will be the best camp & site, etc. Well, we're back form our break and all of the above is true, apart from the road to the campsite Mazhou being very bad. It's beautiful gravel from the gate. The dam wall wash away hasn't changed on the Den Staat road which is possibly the worst corrugated, sink-plaat road I've ever been on. You only need a high clearance vehicle to get through. The Mopani 4X4 trail is a must for 4X4 drivers, with some 2-3 grade obstacles along the way, but a lovely game drive anyway. We did it alone, which is a stupid thing to do, as, if we broke down, there is no cell signal and I'm sure only one vehicle a week or so. It is 19 km long, so a long walk through potential lion / ele country. Although not in the same league as Kruger game-wise, it was one of the best bush breaks we've had and luckily could extend our stay by 2 nights. It seems Mapungubwe is not well Marketed at all as there wasn't a person, staff or otherwise at the Leokwe camp when we had a look and very few vehicles to be seen on our ramblings. Brilliant for us, but not so good for SANPARKS! This post dates back to a couple of years ago. I October 2017, we spent two nights at Mazhou. I have an interest in current history, in particular, the Angolan conflict, and when planing for the trip, discovered a lot more about the history of the park, such as the significance of The Aversion Project, Gerhard Moerdyk, Samaria 28/1 and 2, and the Vhembe military base. To a degree, I might be hijacking this thread, but there is more to Mapungubwe that meets the eye... Smuts Huisie, Poachers Corner, the Bunker at Poachers Corner, Pik se Gat , the swimming pool at the Pinnacle. old one etc. I would like to attach some photos, but an new to this web site and need to work it out first. PS! Looks like I have worked out the photos/galleries, but now need to understand how you add captions. The photo above reflects the Vhembe Military base then, and some of the attractions.